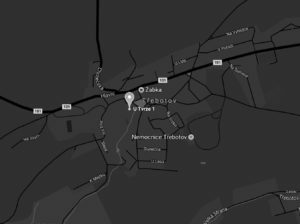 For your convenience, TVRZ TŘEBOTOV offers individual accommodation in several rooms with authentic historical furniture and two spacious apartments for families or friends. We want you to enjoy maximum peace and privacy, so we welcome your children if they are over 10 years old. All our rooms and suites are non-smoking, with wifi connection and minimum rental time is two nights. We have nice wellness (2 saunas, swimming pool, whirpool and massaage). From the comfort of your room or the magnificent oasis of the garden you can reach the center of Prague and the Prague Castle in 30 minutes. Sunny and spacious room elegantly decorated in Art Deco style with original armchairs by famous Czech designer Jindřich Halabala is equipped with a double bed and spacious bathroom with a bathtub and shower. Windows are situated to the south overlooking lovely English garden. This room is named after Merklín Stach, the highest representative of the Greater City of Prague in the 2nd half of the 14th century and the owner of Třebotov. Room Kardinál offers generous space including living room with a study, bedroom and a bathroom with stylish bathtub and modern shower. The bedroom is located in Gothic tower from the 14th century with beautiful view into the garden and the front of the fortress. The room is named after the Archbishop of Prague, Cardinal Schwarzenberg, who stayed in this builing in 1875. Jan & Dorota Apartman welcomes you with two bedrooms and a spacious bathroom with hydro-massage bath. The first bedroom is decorated in late Baroque style with unique tapestries, the second in romantic style of the roaring twenties and thirties in the first Czechoslovak republic. Windows of both rooms overlook the southern gardens with tall trees, a summerhouse and a pond. The room is named after the knight Jan Ledčanský from Popice and his wife, Dorota, owners of the mansion in the 17th century. The single room Augustin is named after a pharmacist from Prague who became the owner of Třebotov in the late 14th century. This distinctive room is furnished in a functionalist style. There is a modern bathroom equipped with a shower and lovely view into the garden and the front of the fortress. This room with a double bed, extra bed and a pristine glass bathroom is named after Václav Bechyně of Lažany, who owned the estate around 1532 and then sold it to the new-town burgher Matouš Hovorčovský. The spacious room is in fusion style that will have you time-traveling from the past to the future. This bourgeois style suite is located in the attic of the south wing. It features two double beds, a large living room, fully equipped kitchen, foyer and bathroom. The windows offer a tranquil view of the garden and the courtyard. The room was named after two most famous nobles owning the mansion, Oldřich and Jan of Valdek. The suite boasting two bedrooms with double beds, two bathrooms and two extra beds is located in the attic of the eastern wing. The larger room features a fully equipped kitchen. The suite's southern-facing windows open up a view to the courtyard. The suite is named after Matouš Hovorčovský, who was promoted to the aristocracy and proudly entitled Sir of Kolivá Hora.